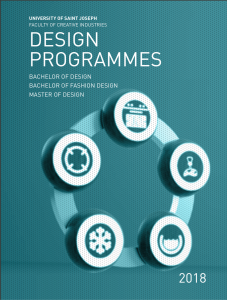 The Bachelor of Design will prepare you for a career as a designer in a wide range of professional fields. The Bachelor of Design enables students to develop the creative abilities and technical skills necessary to become competent design professionals. Students are exposed to a wide range of techniques and fields, with a particular focus on graphic design, digital design, product design, and furniture design. 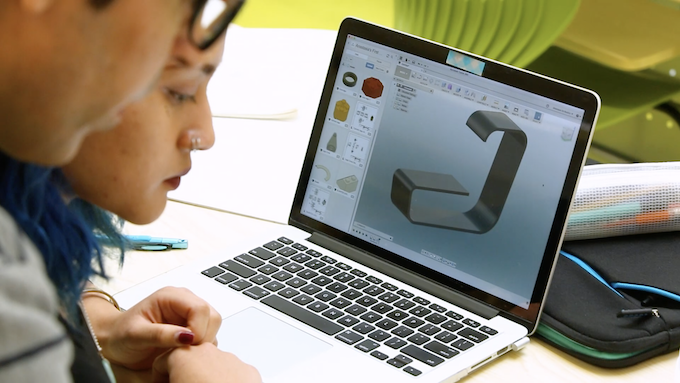 Digital design and fabrication is given a high priority. The curriculum emphasises ethics as well as expertise, requiring students to constantly evaluate the consequences of their work for human environments and societies. Students should have a strong interest in art and design. A portfolio of creative work is required for application to the course. disciplines are becoming central to the city’s ongoing economic diversification. Adjacent to the manu- facturing zones of the Pearl River Delta (the “factory of the world”) Macau is ideally positioned to develop the intellectual and creative capital for new types of design. For local designers, there are incredible opportunities to create and commercialize innovative proposals for the domestic and inter- national markets. The Design Program aims to provide its students with high theoretical and practical knowledge in the wide range of Design Studies. It also seeks to prepare graduate students for their profession, making them special- ized designers and able to conceptualize and create projects in the fields of Graphic/Digital Design, Furniture Design and Product Design. Thus, this 5 bachelor degree aims to promote a deep understanding about the place of Design as a creative field for the society besides underlining topics about the aesthetics and the ethics in Design. Design studios and lecture-based modules are taught by a mixture of local faculty members and eminent visiting professors. Design thinking method- ology, high-level production skills, interaction and decision-making abilities are the mottoes of this bachelor. After four years of studies, students will be aware of the new challenges of the contemporary design society, and be prepared to respond to the structural and organic needs of the local, national and international professional market. Our graduates are good designers, but also good citizens. As Macao completes its shift from a manufacturing-based economy to an almost entirely service-based economy, the design disciplines are becoming central to the city’s ongoing diversification. Adjacent to the manufacturing zones of South China and the Pearl River Delta (the “factory of the world”) Macao is ideally positioned to develop the intellectual and creative capital for radically new approaches to design. While South China’s status as a world-class manufacturing centre has been based on foreign OEM (original equipment manufacturing) products, there is now a rapid shift toward ODM (original design manufacturing). For local designers, there are incredible opportunities to create and commercialize innovative designs for the domestic and international markets. Founded on an appreciation of the importance of sustainability and resource conservation, the Design Program incorporates a wide range of techniques, with a particular focus on graphic design, product design, interaction design, and interior design. The curriculum emphasizes ethics as well as expertise, requiring students to constantly evaluate the consequences of their work on the human environment and society. Our graduates are good designers, but also good citizens. Design studios and lecture-based modules are taught by a mixture of local faculty members and eminent visiting professors. All are internationally recognized professionals, providing the opportunity to develop design skills in a global context. The program allows students to gain the creative and technical abilities necessary to become a competent professional in Macao and the wider world. Incoming Design and Architecture students have a shared “foundation year” in which students learn basic principles of technique and composition before moving on to their chosen specialization. "This module is an overview to the design field from its origins to the present day. The lectures will examine a variety of concepts and works ranging from graphics, product, fashion furniture, interiors, and architecture. These works will be positioned in a wider social, cultural, political and economical context within a historical narrative. This module will also take into account the relation between the object and its designer, as well as the evolving role of the designer — from industry related to activist, producer and creative leader. " "Architecture and Design are subjects that have a strong mathematical basis, namely Geometry, Trigonometry, Topology, and the study of patterns (including their modeling and generation), among other topics. In this course, students will establish the link between mathematics and design through the understanding of theoretical mathematical principles and practical exercises and challenges, some of them using computer software and algorithms as interactive examples of generative design. Furthermore, knowledge of mathematical concepts– such as the Divine Proportion, The Golden Section, Fibonacci Numbers, Graph Theory, Fractal Theory, Probabilities, Randomness, Recursion, Hyper-dimensionality, and Geometry in general - will allow contemporary designers and communicators to understand their designs on a deeper level. " "This module focuses on the concepts, theories and methods of design thinking as a process to foster creativity and innovation. A mean of dealing with complex social and cultural problems_a tool to address a wide range of issues, ranging from graphic design, to sustainability, at both a micro and macro level. " important concepts of thinking through class and group discussion." "This module lets students explore approaches and techniques in automobile and transportation system design, identifying strengths and weaknesses from different perspectives, including aesthetic, stylistic, cultural, technologic, ergonomic and usage patterns. This will have to be done in relation to the main phases of the ""creative automotive design process"". Initially presented via ""concept boards"" including various medium such as diagram, text, hand sketch/renderings, mock-up, or any other necessary materials, the most promising design concept will be selected. This last one will have to be further developed from a technological, functional and aesthetical angle using 3D CAD software (renderings, technical drawings, etc) and other explanatory materials such as text description, pictures and prototyping. " "This module is designed to introduce students to the different fields of science and their social and ethical consequences. It is aimed at students who have no background in science or are non-majors in science. The goal is to give students an overview of what science is and how the different fields of science intersects with everyday life. The course will highlight and encourage discussions on current understandings and research trends in the field of science and how these affect our daily lives. Recent developments in Science relevant to concerns about the nature of life, health and related social issues will be addressed. Through lectures, discussions, debates, research projects, field trips, film-viewing, active-learning activities and workshops, the students will explore such issues as chemistry, stem cell research, pre-implantation genetic diagnosis, genetic engineering/GMOs, forensic DNA, space exploration and energy." "This course aims to explore the relationship between people and the things they engage or tasks they perform every day by establishing an iterative and applied design methodology which utilizes CAD/CAM systems for prototyping and 1:1 production. Starting with the collection and documentation of anthropometric data for each individual in the class, we will summarize and compare it with larger professional studies, to better understand our physical relationship with the objects and furniture around us. We will then move into individual designs, modelling with paper or cardboard and basic tools. Later we will learn how to prepare CAD files and operate a laser cutter so that models can be created with higher accuracy and thicker material. Following a number of iterations and pairing individuals to combine and re- evaluate designs, we will be creating the data for CNC milling the designs at full scale. " This module acknowledges the importance of temporal and spatial pixel-manipulation within digital media. It intends to develop the student’s technical and conceptual skills of render, lighting and materials, useful for presenting their design and architecture projects to clients. The module focuses on a commercial approach, presenting the students with real-world tools for the outside job market. The students will also acquire and understand the vocabulary on the digital medium, and will became familiar with creating digitally inside a 3rd dimension space. The Woodworking module will encourage the students to develop the required skills to design & build an original furniture project, from concept to prototype. Students will improve their technical knowledge - materials characteristics, woodworking techniques and safe operation of hand and power tools - as well as develop their design skills - concept sketching, lateral thinking, technical drawings, ergonomics, project planning – in order to accomplish contemporary furniture project with an original approach to their form/function. "The Infographics and Multimedia Design course provides students with in-depth, hands-on experience in the design and authoring of original multimedia works. Students will have the opportunity to study graphic design and interactive design, emphasizing both technological proficiency and visual literacy. By having a firm grasp on the visual, creative and technological components of multimedia and information graphics, the student will be ready to apply this expertise to a design job in the graphic design, advertising and marketing professions. Furthermore, this programme aims to develop learners in knowledge understanding and skills in graphic communication and multimedia through studio-based assignments. The contemporary context of Graphic Design will be investigated. As Graphic design moves from the creation of closed, static objects to the development of open, interactive frameworks, designers seek to understand their own rapidly shifting profession. This subject, “Infographics for New Media” is going to be the students final design projects and they should use it as an opportunity to develop a communication graph that summarizes the best of their design knowledge and skills. Students should look for their design assets and where they see themselves working in the future, and use this knowledge to help in the development of their design concept and production of their design project. In the course of this module, students will be required to thoughtfully research, ideate, plan, prepare, produce and present their infographics, making the decisions – regarding the concepts, materials, technologies, strategies, etc. – that best translate their ideas. Students will be asked to develop their Final Project under the theme “Infographics for new media”. The theme encompasses design projects that relate with the idea of developing emerging visual displays strategies within the scope of new media (web/mobile). • Patterns for interactive Web Infographics"
"This module aims to approach the complex subjects pertaining to interior design, interpretation and re-interpretation of standard models and relations at different levels and scales, the comprehension of spatial organization, including the confrontation with mixed-use structures and the dynamics generated through design. It addresses the disciplinary and operational concepts within the practice of design while deepening the critical awareness and understanding of the cultural context of interior architecture, as well as the development of the discourse that manifests the necessary vocabulary/knowledge and the ability to communicate the intentions of the project. As a result, the design process is considered as a means for the understanding of the built environment and a vehicle for the transformative intervention. It is intended that by the end of the module the student will have acquired proficiency in the domain regarding the different aspects within the practice of interior design regardless of the topic and scale, from conceptualization and structuring of universes in terms of integration of programmatic components to choosing the respective furnishings, materials and lighting, including also the principles of construction. " "The objective of this module is to able the student to be a creator.. In Design-Lab Animation the students are also given the knowledge of the most advanced tools today in digital animation creation, and are taught on the most efficient way to use them according to a real life production pipeline. " "In the theatre, we say that people will only care to listen to you if you have pleasure to be on stage. Our capacity to effective communicators is built upon this foundation: Play, Playfulness, Pleasure. This class is designed as an introduction to acting and the interplay of human communication in the Dramatic arts. We will use the techniques or principles used in dance and theatre as a basis for developing your creativity, self-expression, collaborative skills and public speaking skills. There are many ways to communicate. The performing arts are a great tool for problem solving, innovating, and working within constraints. You will learn to think creatively “on your feet”. There are no right or wrong answers in the process of creation, only choices that become more appropriate within the given circumstances. We all see that the world is both becoming more and more removed from social interaction, yet at the same time the same technology, has created a need for sharing ideas. Artistic self-expression has become increasingly democratic. At the heart of this dichotomy is the ability to communicate together. This class is part of that essential ingredient. To be comfortable with your own capacity to share your imagination, vision, point of view with others." "This module provides an overview of Entrepreneurship as a structured process based on Innovation, and to Systematic Creativity. Students will undertake a journey that starts with ideas about existing needs and problems, in their field of expertise and converge into Business Models that describe how one can create, deliver and capture value in Products, Services, Experiences or Processes. The module sessions is based on theory lectures and practical project development, where students explore tools and methodologies, that support them in their creative process and in formulating an innovative entrepreneurial endeavor. The business module is also validated by a target audience and is complemented with a strategy to attract the necessary funding. Classroom sessions will involve presentations of concepts, group work, peer presentations, and discussions. For this module you students attend learning sessions and workshops and complete several individual and group assignments in class and in their own private study time. The learning sessions will be a mixture of discussions and teamwork, presentations, and other interactive activities. Additionally, students are expected to devote time each week to preparing for class and completing assignment work." The portfolio is a carefully designed visual and textual presentation of the unified body of work of a student, incorporating their full range of projects, skills, and vision. It is a synthesis of all modules and topics areas within the course (design, technology, history, theory, communication) and a holistic means of assessing student achievements. As the most important document for demonstrating the quality and competency of the individual designer or architect, the portfolio is used nationally and internationally for entry into design or architecture schools, postgraduate study programs, and into professional practice. "All students must complete at least eight weeks of internship at an approved design department office. During the internship, the students must keep a log of all their work, and examples of their outputs. This module will run as a studio with no fixed sessions where the lecturer will assist the students with their final assignments. The lecturer will also be seeing how the students are doing in the respective organisation and assist the students if any issues arise." "Students will be asked to develop their Graduation Projects under the theme of “In(com)possible Design”. The theme encompasses design projects that relate with the idea of developing compatible and consistent design products, where the two main concepts such as “impossible” and “compossible” are brought together. To be “incompossible” means to be unable to exist if something else exists, to be incompatible, inconsistent or not capable of joint existence. The “composability” is a philosophical concept defined by the German Philosopher Gottfried Wilhelm Leibniz (1646 – 1716). It has a logical sphere more restricted than that of logical possibility. The “compossibility”, to exist, it is not enough that something is possible, it must be compatible with others that constitute the real world. Out of Leibniz's theory, the notion of compossibility can be simply defined in the following way: two possible are composibles if they are possible at the same time. Compossibility differs from possibility stricto sensu in that it is a possibility with something else. This notion draws attention to the fact that several individually possible facts are not necessarily possible with each other. Imagine a door, that can open and close. The condition “The door open” is possible; The condition “The door close” is also possible. So, we can confirm that both conditions of that door are compossible. But, in our real world, the door cannot be opened and simultaneously closed, in a sense that these two conditions, if put together, are “incompossible”. The concept of incompossibility is very interesting when we thing about projects that relate to interactivity and interaction design. This concept should be understood as a continuity in terms of positive design, and as a strategy to develop innovative design products. Impossible design is possible, should it be in(com)possible?" Student will have the opportunity to develop projects that focus on Integrated Marketing Communication approaches, facilitate theoretical models and hands-°‐on practice. Students will learn to prepare communication plan, as they attempt to communicate their advertising and promotion ideas associated with both local and global brands. "Design management is the area of design that connects the management of people with projects, processes and procedures behind a sustainable and experienced organisation. Design management relates to the management and relationships between different disciplines and responsibilities. This module reviews and examines the practical and operational actions and processes in typical design practices and the common issues and concerns that managers go through. Design is not isolated from other fields and in fact it is part of a relationship. That relationship is what drives the problem-solving aspect, allowing it to unravel any challenge. In this module, we will explore that relationship, showing how design is managed and how it can have a positive impact and function comprehensively in relation to various contexts. Design management is one of the main challenges faced by anyone learning about and working within the design field, businesses and creative industries today. Design is accessible in a tangible way and it’s seen in people, projects, products and in services in which we are in constant connection every single day. In this module, we will examine what are the differences between design management and design leadership and how to reconcile the two, explaining how students can merge design and business aspects effectively." "This accelerated course module is designed for students of Chinese heritage and advanced beginners with good speaking and listening skills. The focus is on reading, writing, and grammar, along with continuing improvement of oral communication skills. The purpose of instruction is to utilize previous language background to lay a solid foundation for further Chinese language study. "This accelerated course module is designed for students of Chinese heritage and advanced beginners with good speaking and listening skills. The focus is on reading, writing, and grammar, along with continuing improvement of oral communication skills. The purpose of instruction is to consolidate the foundation which students have built in their first level Chinese courses, to expand their vocabulary, and to introduce them to more complex grammatical structures. "This module covers a variety of modern Chinese literary genres including essays, short stories, biographies, and criticisms. Emphasis will be on reading comprehension and expansion of vocabulary. Class discussions are on some substantive issues related to the readings.